Aaron Boone is currently an ESPN game analyst and is a former MLB third baseman who played for the Cincinnati Reds from 1997–2003, the New York Yankees in 2003, the Cleveland Indians from 2005–2006, the Florida Marlins in 2007, the Washington Nationals in 2008 and the Houston Astros in 2009. Aaron Boone and his brother, Brett are third generation MLB players. His grandfather, Ray Boone, played for 13 seasons in the major leagues and his father, Bob Boone, played for 19 years in the major leagues. 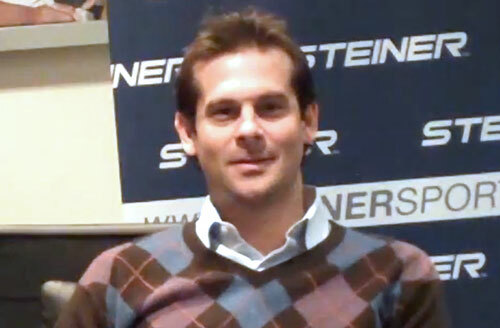 Aaron Boone was a 2003 All-Star and is currently employed by ESPN as a game analyst. Sports Speakers 360 is a booking agent for pro athletes. If you would like to book Aaron Boone for a speaking engagement, appearance or endorsement, contact an Aaron Boone booking agent for fees at 1.855.303.5450.